It is one of great accomplishments of Vancouver’s Friends of Chamber Music that they sponsored the Emerson String Quartet in its infancy and that this ensemble has returned to perform in Vancouver for each of the past 30 years. In the meantime, this quartet has become one of the most celebrated quartets in the world, recording in all areas of the string quartet repertoire and achieving the highest possible honours. 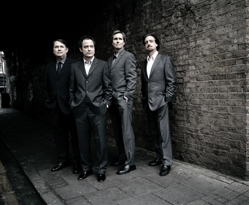 The group’s takeoff probably dates from 1987 when it signed a contract with Deutsche Grammophon and, in the next decade, recorded complete cycles of the Bartok, Shostakovich, and Beethoven Quartets. In recent years, they have moved on to record Mendelssohn, Brahms, and now the Czech composers, Dvorak and Janacek. Right from of its Julliard beginnings, the Emerson Quartet concentrated on presenting chamber music ‘objectively’, solving its technical demands in a virtuoso style, and highlighting its thrust, power, and brilliance. Few quartets in fact have divided critical opinion so radically. In North America, the ensemble was praised for its ability to play works with an exactness and urgency seldom equaled. In England and much of Europe, the opposite opinion came forth: the Emerson’s illustrated only the technology of quartet playing and did not probe the emotional depth and sensitivity of the music being played. The Penguin Guide for example often referred to the Emerson’s performances as ‘chromium-plated’: surface gloss without real substance. I admit that my past response to Emerson performances was a qualified one. It seemed that they approached many works by asking what they could do for the music rather than the humbler question of what the music could do for them. Thus, I have never felt that the Emerson’s really relax with the music’s joys or sorrows; rather, they seem more concerned with shaping works to their own technical requirements. As well, in the slower movements, emotional and contemplative depth seems to be avoided. Instead, we get a large (and indeed beautiful) sound that expresses romantic sentiment in general but does not quite fit any one composer’s spirit exactly. The Emerson interpretations were therefore difficult to’ love’, no matter how I tried. Which brings me to better news! The Emerson Quartet is now getting ‘old’ and perhaps does not get the same pleasure from demonstrations of power and technical bravura. This year’s performances of Dvorak’s Op. 51 and Op. 106 quartets, two of the composer’s finest, were probably the most unexaggerated, selfless performances I have seen from this group. Dvorak’s quartets are highly regarded because they have great melodic flow, subjective feeling, and rhythmic momentum. To be successful, a quartet has to balance these ingredients within a consistent structure (a very flexible and imaginative first violin is an asset). Thus, one cannot be too impassioned or driving or literal, or all is lost. The firmness and balance of the Emerson’s structure was notable throughout. Except in the slow movements (which were dramatically powerful but slightly too fast and not meditative enough), both works were articulated with consistent insight. Each of the alternating first violinists, Philip Setzer and Eugene Drucker, also made an effort to bring out the subtlety and range of this part, though it would be idle to pretend that they had mastered this like the Czechs. In general, judicious restraint ruled over dramatic brilliance and I was able to get a very satisfying and complete picture of each work. The Op. 106 lays claim to being Dvorak’s finest quartet, and its final movement is very difficult to bring off. Here the Emerson’s performance was beautifully judged; the music just played itself. All the contrasting elements in this movement fit together perfectly. No extra emphasis was needed to generate the genuine excitement at the end. There is probably not that great a difference between the previous Emerson Quartet and the one I have just seen. But it does show is that a small reduction in the self-consciousness of these talented artists can have real benefits in communicating musical content. Let’s hope the transformation continues! Their just-released cycle of the Dvorak Quartets is on DG 000289 477 8765 (3CD’s).